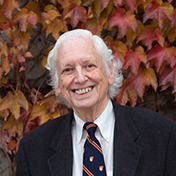 Jerrold Meinwald’s research at Cornell University, where he was the Goldwin Smith Professor of Chemistry Emeritus, has concerned molecular rearrangement mechanisms, the synthesis and reactions of highly strained ring systems, natural product structure and synthesis, anesthetic stereochemistry, and insect chemical ecology. After service in the US Navy (1945-46), Dr Meinwald was educated at the University of Chicago (PhB 1947, BS 1948) and at Harvard (MA 1950, PhD 1952), where he worked with RB Woodward. He is a founding member of the International Centre of Insect Physiology and Ecology (ICIPE) in Nairobi. Dr Meinwald is an elected member of the National Academy of Sciences (1969), the American Academy of Arts and Sciences (1970), the American Philosophical Society (1987), and has held two JS Guggenheim Fellowships (1960-61; 1976-77). He has served as a Fogarty Scholar-in-Residence at the NIH (1983-85). He received the ACS Ernest Guenther Award in 1984, and an AC Cope Scholar Award in 1989. In 2014, Dr Meinwald received the National Medal of Science, the highest honor in the USA for achievement and leadership in advancing the fields of science and technology. Dr Meinwald died of cancer in April 2018. Dr Meinwald served as a Fellow of the Center for Advanced Study in the Behavioral Sciences at Stanford, California (1990-91). He shared with Thomas Eisner the Tyler Prize for Environmental Achievement in 1990, the Gustavus John Esselen Award for Chemistry in the Public Interest in 1991, the International Society of Chemical Ecology Silver Medal in 1991, and the 2006 GRAND PRIX from La Maison de la Chimie in Paris. The Academy of Sciences of the Czech Republic awarded him the Heyrovsky Medal in 1996. He received the 2005 Roger Adams Award in Organic Chemistry from the American Chemical Society, the 2013 Benjamin Franklin Medal in Chemistry, and the 2014 Nakanishi Prize from the Chemical Society of Japan. Jerrold Meinwald was the recipient of the 2014 National Medal of Science in Chemistry. He was on the Editorial Boards of the Proceedings of the National Academy of Sciences (USA), Chemistry & Biodiversity, and the Journal of Chemical Ecology, and has been Secretary of the American Academy of Arts and Sciences since 2004.